He knows he has good ideas. He is damn sure he can help his audience. He has the facts to prove his claims. Not fake facts, not alternative facts, but real facts backed by science. But still … people aren’t listening. Sometimes he wants to scream. HEY YOU. LISTEN TO ME. I KNOW BETTER. But he knows it wouldn’t work. So how can he coax skeptical readers to listen and follow his advice? 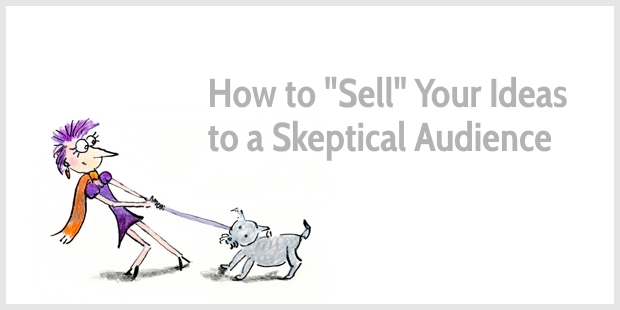 “Selling” ideas to skeptics may seem a daunting task. But if you really understand your audience, and if you get why they are skeptical, you have a chance to persuade them. It ain’t easy. But it is possible. Last week, I read the book the NYT bestseller “10% Happier” by Dan Harris. The author is an A-type award-winning journalist and news anchor. He reported from war zones, dodged bullets, and got addicted to ecstasy and cocaine. In 2005, Harris has a panic attack on TV, watched by 5.019 million viewers. He goes on a reluctant journey to find peace in his mind. The book summarizes this journey, and it’s a passionate pitch to practice meditation and become more mindful. Until recently, I thought of meditation as the exclusive province of bearded swamis, unwashed hippies, and fans of John Tesh music. Moreover, since I have the attention span of a six-month-old yellow Lab, I figured it was something I could never do anyway. I assumed, given the constant looping, buzzing, and fizzing of my thoughts, that “clearing my mind” wasn’t an option. When readers feel you understand their reluctance, you have a bigger chance of winning them over. So, don’t climb on your pedestal. Don’t think readers are ignorant. Don’t mistake their skepticism for lack of sophistication. We like to think of ourselves as rational human beings. But we vote with our hearts. We make emotional decisions, and then justify our decisions with rational arguments. So, before you reel off the scientific facts proving your points, connect with readers emotionally. Understand their problems, their frustrations, their fears. The mental loop (How many stories have I had on this week? etc.) that began when I first arrived from local news went into hyperdrive, only with an even more personal tinge. It was one thing, back in the day, to be big-footed by a veteran correspondent—but to be beat out by someone my own age, now that stung. I’d collect data points (Weir gets to cover the election of the new pope? Muir is filling in for Cuomo? ), and immediately extrapolate to far-reaching conclusions (This means that x or y executive or anchor dislikes me → My career is doomed → I’m going to end up in a flophouse in Duluth). Most readers aren’t news anchors or journalists like Harris. They might not even be as competitive as he is. But even if the specifics of their doom thinking are different, they recognize the pattern and feel understood. You could describe the book “10% Happier” as a memoir—the story of how Harris stopped the chattering voice in his head without losing his edge. But this book is more than a memoir. It’s a how-to, a review of books on meditation, and a report of interviews with a variety of religious leaders and meditation experts. This mix makes it extraordinarily persuasive. To a man (or woman), the people I had the courage to admit how I was spending my vacation asked something to the effect of, “How can you go without talking for that long?” Silence, however, is the part that worries me the least. I don’t imagine there will be many people at the retreat I’ll be dying to chat with. What truly scares me is the pain and boredom of sitting and meditating all day every day for ten straight days. For a guy with a bad back and a chronic inability to sit still, this is definitely a suboptimal holiday. Harris’ ambivalence towards meditation is real, and he doesn’t find it easy to conquer this reluctance—just like it’s hard for his readers to overcome their skepticism. In other words, you show readers a route from a miserable or not-so-pleasant place to a sunny destination. It’s tempting to make that sunny destination look as perfect as an Instagrammed vacation. But would skeptics believe this perfect image? I found that rather than rendering me boringly problem-free, mindfulness made me, as an eminent spiritual teacher once said, “a connoisseur of my neuroses.” One of the most interesting discoveries of this whole journey was that I didn’t need my demons to fuel my drive—and that taming them was a more satisfying exercise than indulging them. My consumption of Buddhist books was paying off. Throughout the weekend, I made a deliberate effort to pause, look around, and savor things while they lasted. There were little moments, like running errands for Bianca—for example, putting her carefully curated gift bags in people’s rooms—and actually enjoying it. Or when I babysat my adorable, big-eyed baby niece Campbell in my room while everyone else was out having lunch. She sat on my lap and cooed contentedly while I ate a cheeseburger, trying not to drip ketchup on her head. (…) As soon as I got back home from the honeymoon, though, my penchant for worry reasserted itself—provoked by a conundrum at work that I simply could not figure out how to handle in a Buddhist way. If you feel dishonest when sketching your ideas, then your words are probably a bit too Instagram-perfect. Try injecting a sense of reality. Reality won’t undermine your persuasiveness; it might even enhance it. From a marketing perspective, it’s easier to sell when people already are convinced what solution they need—you only need to explain why your solution suits them best. But sometimes, we want to do more than that. We want to share our ideas. We want to help more people. We want our words to spread. So, don’t give up on the skeptics. Instead, understand their concerns and hesitations. Meet them where they are, and show them the way. Ah, this would have been so helpful a few years ago, when I was so badly trying to show the corporate company I worked for, the value of implementing a service program. Being an IT company, they simply did not understand, and I never could fully convey the magnificence of the idea to them! I’m sorry to be too late with this article! I feel your pain. I’ve also been there, in my corporate life, trying to persuade people to invest in good content marketing. It is tough, and I wasn’t able to do it at the time (over five years ago). Maybe my persuasion skills weren’t good enough, or maybe it was just the wrong place or the wrong time. Ha ha, thank you Henneke! Your reading list is getting more and more interesting. Have you always read on such wide range of topics? The way you sum up… about the difference between people who are already looking for a solution in your field, vs sharing ideas and helping more people… I find extremely relevant for me! I hardly read books in my corporate life apart from the occasional novel. Since I quit my job, I’ve gradually started to read more. Initially, a lot of marketing books, but after some time I got bored with that and started to read more widely. I now go through periods where I read a lot non-fiction books, and then I have periods when I only read fiction. And yes, please don’t give up on the skeptics. Before taking your course, I was a skeptic, too. I didn’t think I could draw and I didn’t think I was creative. And somehow, I’ve now illustrated my blog for just over four years! Thank you. I still find it hard to give up on books I don’t enjoy. They lie there half-read, and I keep thinking I will get back to them and have another try. Perhaps I will follow your lead and give myself permission to abandon them immediately :). Yay for Henrietta and your blog… both so helpful and also entertaining on many levels! I still find it hard to give up on books I don’t enjoy, too. Recently, I was reading a rather badly written book, and I tried forcing myself to read it because I thought I should find it interesting and I should learn something from it. But why waste my precious time reading something that bores me? I started reading another book, initially thinking I’d turn back to the boring book in a few days, but I now realize it’s better to give up. Life is too short for reading books that don’t fascinate us. And there are so many fascinating books to read! Either you have a spooky talent for posting just the right blog exactly when I need it, or ALL your posts are excellent ALL the time. I’ll let you know when I’ve worked it out. In the mean time, many, many thanks for making my life more than 10% better today. When I think about business communication, I always come back to the most important part of that term – communication. Whether it’s for business or personal reasons, communication is at the heart of what makes it work. Or not. And now you make me think about it, good business communication is not that much different from good personal communication. I find that since I learned how to blog, I’m a better communicator overall. I enjoyed “10% happier.” It’s well written and the topic fascinates me. If you get a chance to read it, let me know what you think of it? I will try this story frame on the next blog post I write, and then let you know how it goes. Love your posts, they are always on point, helpful, and so fun to read. Thank you for your lovely compliment, Dawn. I don’t think you always need to include all points mentioned here in one blog post, but it’s good to create a strong mix over time. The book “10% Happier” is relatively light on the science of why meditation works, and I still think it’s important to include the facts on a blog, too, but not necessarily in every post—just like not every post needs to include a personal story. Hi!! That was such a great read. I was writing at the time (ideas for a FB Live to some skeptical home sellers!) and I stopped for a minute to check my email and there was your email with your link to this!! Talk about synchronicity! I immediately inserted my personal story on how my life was when I had to get ready to sell my first house. I needed to have the audience connect with me emotionally – rather than speak to them from my cloud on high!! I’ve been working on this, not with my writing, but presentations to live audiences. To be perfectly honest I’ve discovered some groups are lazy. They put their reluctance on the speaker, telling them (including me) that the presentation didn’t do this, that or whatever. So, I’ve been working on putting that unspoken reluctance back on them and your points are right on! I like this point you make: “I might add that most people need more than a nudge. Maybe multiple nudges or a big fat one.” Great point! Thank you for adding your thoughts, Jeff. I appreciate it. Of course, that’s not the full solution—it’s only a basic principle. And the bigger the reluctance, the more difficult it is to punch through it. After all, Harris doesn’t write for meditation-deniers but for people who feel reluctant to meditate. Thanks for another great insight Henneke. It helps to overcome scepticism if you have experienced what you are talking about. If your experience is second hand, such as reporting other people’s experience, then it’s hard to find the right emotion to get your message across. Yes, that’s a good point. It certainly helps if you speak from personal experience and understand the emotions and frustrations first hand. If you write about other people’s experience, they’ll have to be open enough to share their feelings and reluctance. That’s a much tougher job. I’m glad the sun is still shining on you! Great article. This is such a great line you referenced: “One of the most interesting discoveries of this whole journey was that I didn’t need my demons to fuel my drive—and that taming them was a more satisfying exercise than indulging them.” This is why I think many people fail in the end to get where they want to go when they depend on demons—at some point, the demons win. Yes! That was one of my favorites, too. We can be ambitious and reach our goals without the need to beat ourselves up and self-criticize all the time. This is something I’m still learning, but I’ll get there! Henneke you’ve made so much sense … again … with very explicit examples. Every word is a lesson. That’s what makes me turn your pages. Thank you for your wisdom. Again, I’ve thoroughly enjoyed reading you. I believe that honesty is your best weapon to connect with an audience. JUst be yourself, Don’t make outlandish claims or try to overinflate who you are or what you’ve accomplished. Just offer something of value in an honest way and the rest will take care of itself. Yes, I agree: Offer value and be honest.